Retail Price $35.95 0 0 Like this product? This unique gift includes the glass jar, filling, ribbon, kind notes charm and 31 of most popular get well soon messages, each individually enclosed in mini decorative envelopes. This is a thoughtful gift that can be enjoyed day after day. With the warmest of wishes, this jar of 31 get well wishes just comes to say hope that you're feeling much better today and wishing that each day brings you renewed strength, brighter times and a healthier, happier you. Get well soon. Cheer up a friend or loved one with this unique jar of 31 get well wishes enclosed in mini decorative envelopes to be opened each day or anytime they need a lift. 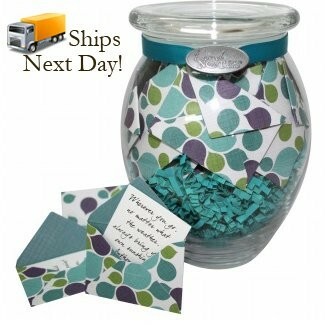 This unique gift includes the glass jar, filling, ribbon, KindNotes charm, and 31 of our most popular get well messages, each individually enclosed in specialty linen cardstock envelopes - a thoughtful gift that can be enjoyed day after day. Container: 3 3/4-inch x 6-inch Envelopes: Approximately 2 1/4-inch x 1 5/8-inch (closed) Paper: White 90lb. index. 1 1/2-inch x 2 1/8-inch. Gift box included. Sample Messages: Rise above the storm and you will find the sunshine. -Mario Fernandez; Wishing that each day brings you renewed strength, brighter times, and a healthier, happier you. Get well soon. ; With the warmest of wishes, this just comes to say hope that you're feeling much better today. This is the perfect gift for someone who is in the hospital for an extended period. Our very dear Daughter-in-law sent it to my husband, and he and I both looked forward to a cheery message each morning. When someone isn't interested in food, had enough flowers, and isn't up to reading, KindNotes make the perfect gift.